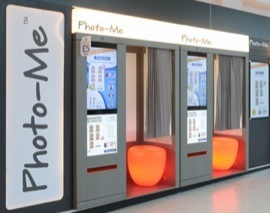 Photo booth operator Photo-Me International has seen revenues increased by 3.8 per cent to £184m, aided by the introduction of self-service laundry machines and a new Japanese identity card. The company has been the parent of Jolly Roger, the kiddie rides manufacturer, for several years. The Photo-Me full-year profits also promise further improvements from a deal with Moneygram and ANTS - the French national agency of secure documents - which will see booths provide digitised e-photo and signature services for the country’s new driving licences.